A team of engineers under the guidance and supervision of Dr. Nish Sonwalkar, (ScD, MIT) founder and chief scientist for Power2peer, has reached an important milestone, successfully demonstrating the efficacy of the Software Defined Network (SDN) controller for the Advanced Solar Microgrid. This is a crucial element of creating the resilient solar microgrid network. Connecting microgrids via SDN controller allows dynamic configuration of the power network backing up households in case of grid failure. The resilient solar microgrids ensure uninterrupted power to households even when some of the solar microgrids go down during natural disasters. SDN controllers driven by Artificial Intelligence (AI) can sense which grids are operational and configure the power network so that households receive power from operating grids in real-time. 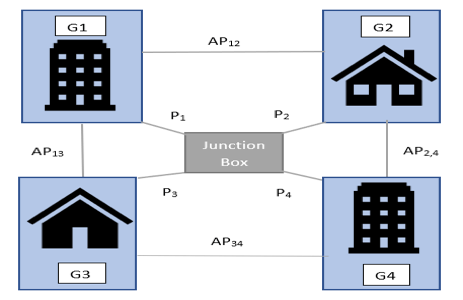 As shown in Figure 1, to create the SDN, grids G1, G2, G3, and G4 share a junction box that connects to all panels via power cables, and is equipped with a microinverter that sends information about power generation to the wireless network. The central junction box also transmits information to the controller, which distributes power based on the power load of each grid. The Software Defined Controller at the center of the connected microgrids acts as a load balancing device which ensures that the loads connected to each grid G1, G2, G3, and G4 are all served. If one or more microgrids are non-operational, power from other connected grids is diverted to serve them. The controller’s ability to provide adaptive distribution of electrical power is what makes the adaptive solar microgrid more resilient than the traditional centralized grid. Demonstration Project: A working demonstration of the resilient solar microgrid has been completed as shown in Figure 2. 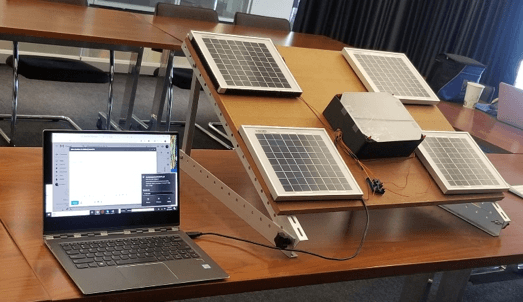 The demonstration included four solar panels with 36 solar c-Si solar cells, each generating 5W, representing four solar microgrids. The four-grid power network is connected to a central software controller device. The four panels are each serving a power load represented by LED lights as per the schematic shown in Figure 3. Also shown in Figure 3 is the junction box at the center, which has a microprocessor recording the current and voltage generated by each solar panel, sending information to the software defined network (SDN) controller. The control systems with sensors and relays is shown in Figure 3. 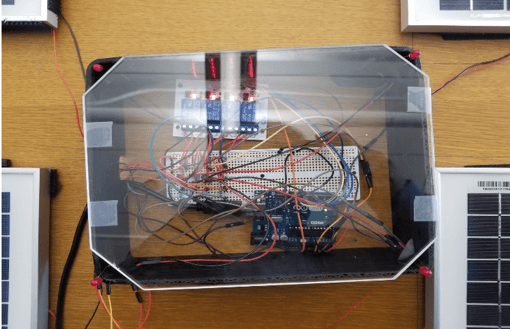 Results: We were able to demonstrate that in response to a failure in Grid 1, the current flows to all four LEDs from the other three grids. When two out of four grids are failed, the four LED are still running with the remaining two grids. Even when the three out of four grids are out the LEDs still remain lit, although with lesser power. The SDN controller automatically senses failure in the grids and reconfigures the power network in an intelligent way to supply power to all four LEDs, which again represent households connected to each grid. This technology is crucial to ensure the resiliency of power supplied by solar microgrids. For our next project, the SDN controller design will be used for a 15.6 KW solar microgrid pilot in Burlington, MA. Stay tuned for more updates about our progress!